That’s what appears to be the case for University of Utah computer science professor Mary Hall and her 14-year-old daughter, Jackie Hall, whose team of four girls and their robot, “Roger,” were chosen to compete in the upcoming FIRST Tech Challenge Super Regional Championship Tournament in Oakland. Jackie Hall’s team, called the “Skeleton Crew,” is mentored by her mother, father (who also is a computer scientist) and an aerospace engineer. The group of four middle-school girls and their robot competed in the FIRST Tech Challenge Utah State Championship at Weber State University Feb. 21. Afterwards, they along with another team from Utah and one from Idaho, were chosen to go to the Super Regional Championship in March. “We are very surprised and very excited because it’s our first year in the FIRST Tech Challenge,” Mary Hall said about her team. In this year’s competition, teams of 7- to 12-year-old students are tasked with building a robot that must locate the position of a tower with an infrared sensor and then dump balls into the tower automatically. The robots also must perform other tasks to get points. In the Utah State Championship, 29 teams from Utah, Colorado, Montana, Idaho and California competed. 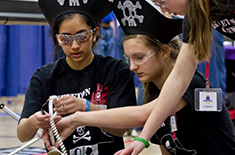 In addition to “The Skeleton Crew,” two other Utah teams will be going to the Super Regional Tournament, including the “Grid Skippers” and “The Lady Bots.” The Super Regional Championship Tournament will be held March 27 – 29.